In 1575, when midwife Hannah Levi rescued the newborn son of wealthy Venetian parents from being slain by his larcenous uncle, she fled with the orphaned child and her husband Isaac to Constantinople. They doted on their adopted son and allowed themselves to hope there would be no repercussions. Matteo’s entire family had perished in the plague and Hannah and Isaac were his world. But Matteo, heir to fabulous riches of the di Padovani estate, attracted the attention of Antonio Foscari, a scoundrel in desperate need of a fortune. Cunning and flamboyant, sporting a sinister silver nose, Foscari still is no match for his spirited accomplice, the scheming Cesca who had wormed her way into Hannah’s life. Cesca and Foscari abduct Matteo and abscond with him to Venice. Foscari plots to have the court declare him guardian—and then plans to kill the child. 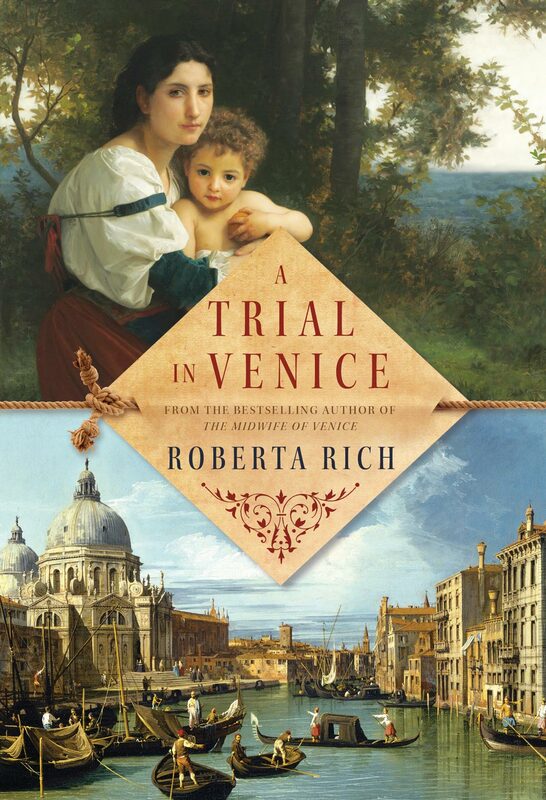 When Hannah, in her distress to save her child, is lured to Venice, she is arrested and jailed. She must stand trial for the murder of Matteo’s uncle. In this stew of avarice and deceit, there is one truly noble character, the esteemed architect Andrea Palladio who owns the villa adjacent to the lands once controlled by the di Padovani family. 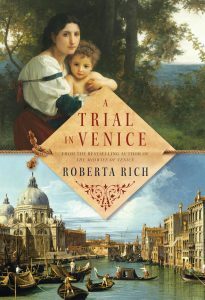 Roberta Rich secured a respected place in the gallery of historical novelists with The Midwife of Venice, which introduced Hannah. An international bestseller, it has been licensed in 18 countries. It is followed by The Harem Midwife and A Trial in Venice. In her next novel, Roberta Rich turns to the rich period in American immigrant history—the colorful, quarter of New York’s 19th Century tenement district.